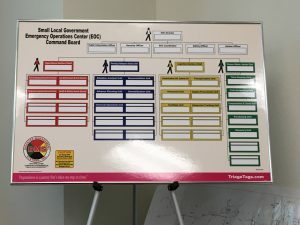 GARS Member KI6SMN Participates in EOC Training – Copyright © 2019-2025 Glenn Amateur Radio Society. All rights reserved. In the video above (click on the “Watch on FaceBook” link below where it says “Unavailable”), the explosion at the end is an inside joke. KI6SMN (Phil Zabell) participated in the “Essentials of Emergency Management Concepts E 16-17” class offered at the Glenn County EOC, May 21-24,2018. Nearly 50 people from law enforcement, fire, public works, and various County offices took the training provided by Cal OES through their CSTI (California Specialized Training Institute) Unit. An EOC consists of five components: Ops, Planning & Intelligence, Logistics, Finance & Administration, and Management. KI6SMN served as the Communications/IS Unit Leader which is part of the Logistics Component. Coms/IS is responsible for keeping the radios, phones, and computer equipment functional. After three days of training, the final day involved a real time exercise using a scenario where there had been four days of heavy rain in Glenn County and surrounding areas. According to the de-brief led by the instructors at the conclusion of the exercise, we had learned our lessons as no lives were lost despite the massive evacuations and Willows moving toward the status of becoming an island until the water receded.